"Hi Drew, I'd really like to talk to you, but there are many far more important people here for me to talk to right now"
In 1987, Arthur Carter began publishing The New York Observer, the salmon-colored broadsheet covering NYC politics, show business, gossip and media. The Observer's first editor was Carter's lawyer John Sicher, followed by SPY magazine co-founder E. Graydon Carter, who left to edit Vanity Fair, and was replaced by SPY's Susan Morrison. 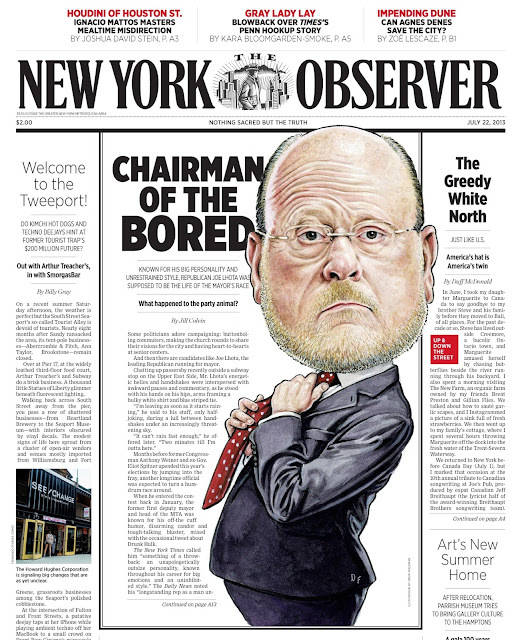 Journalist Peter W. Kaplan became the Observer's new editor in 1994 and one of his first objectives was to line up four artists to create the newspaper's weekly covers each month. 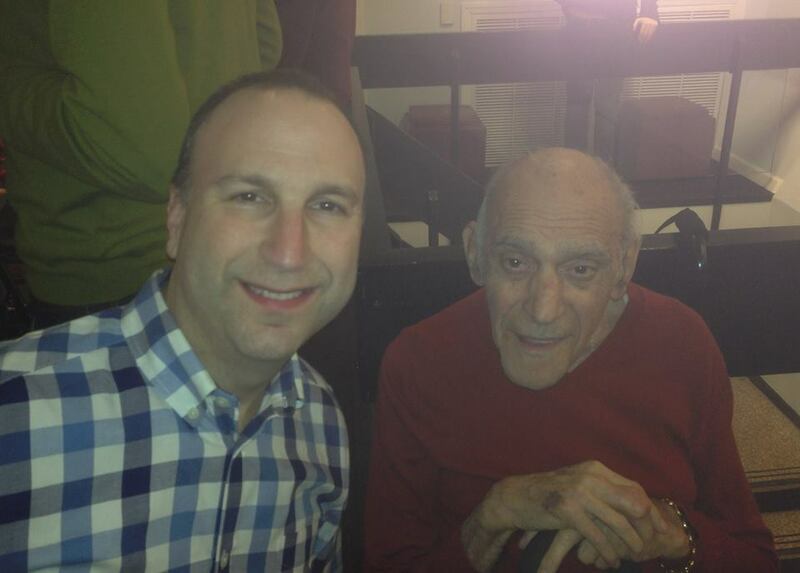 Peter knew my work from SPY and first called me with an assignment to draw senator Al D'Amato. We instantly hit it off, realizing we shared a mutual love of old comedy films, Frank Sinatra and MAD magazine. 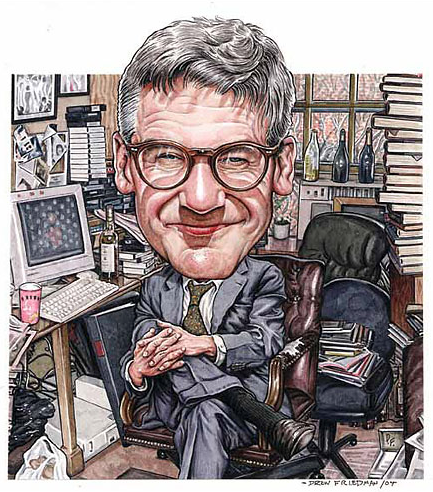 Peter soon lined up the great caricaturists Philip Burke, Victor Juhasz and Robert Grossman as his other cover artists. He referred to the four of us as his "Murderer's Row", referencing the unbeatable 1927 New York Yankees starting lineup. 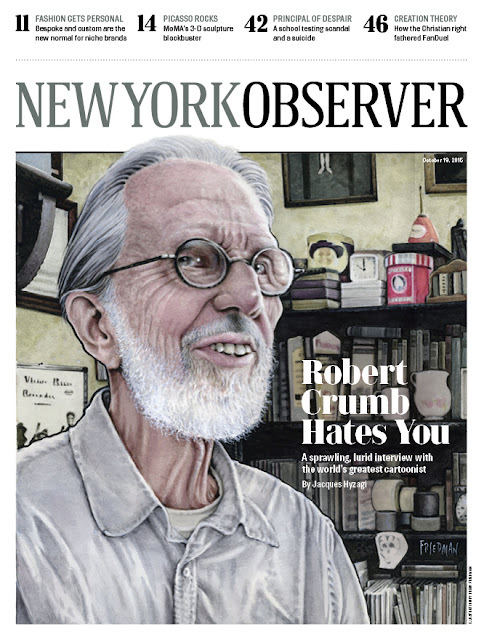 Working directly with Peter, The four of us would create weekly covers for the NY Observer (the NYO), for the next 15 years, with Barry Blitt drawing the small B&W cover caricatures. 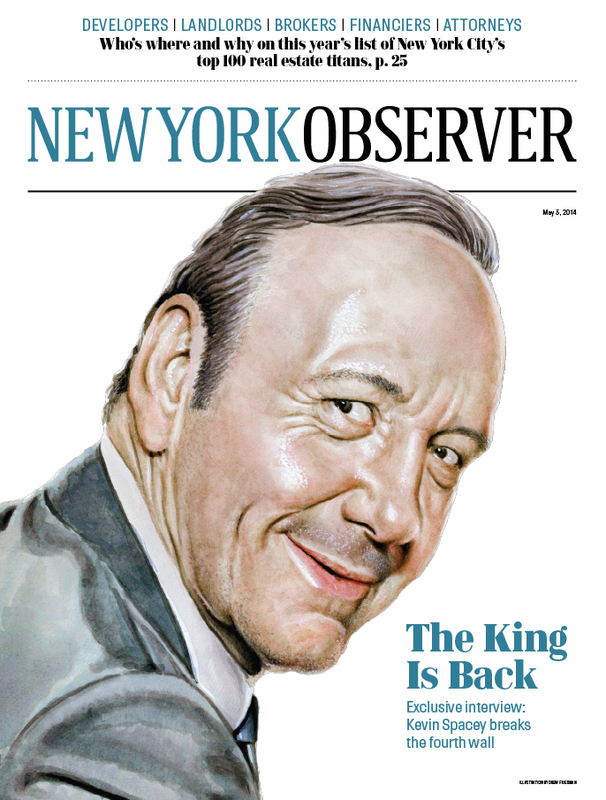 In 2006, twenty five year old real estate developer Jared Kushner purchased the Observer and Peter Kaplan continued on as editor. I would create over 50 covers over the next 10 years under the Kushner regime. 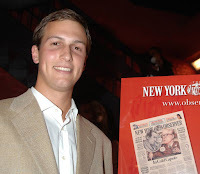 When I first talked with Peter about Jared, he seemed excited about the future prospects of the NYO with this young, wealthy new publisher, equating him to Orson Welles as the young Charles Foster Kane, purchasing a money-losing newspaper and injecting new life into it. It didn't take long before I started picking up on slight pauses and hesitations during our conversations about how things were going, and Peter's pauses and hesitations spoke volumes. I sensed that things were perhaps not going according exactly to plan. I never pressed Peter for any details, we mostly talked about the Marx brothers, Jerry Lewis, Jack Benny, Popeye and Joan Blondell, but the writing seemed to be on the wall. Peter, who was passionate about the NYO, seemed increasingly frazzled during each subsequent phone conversation. (The Borat film was about to be released). as if I had done him a tremendous favor. which publisher Jared Kushner hosted. was standing at the bar by himself holding a glass of champagne. I approached him "Hi Jared, I'm Drew Friedman". far more important people here for me to talk to right now". I quietly nodded and retreated back to my wife and friends. here for him to talk to then me". 14 years would soon be retiring from his beloved NYO. all four of the "Murderer's Row" cover artists under Peter Kaplan's regime. enjoyed most about his son's publication were the illustrated covers. during your speech?" He looked bemused but said "sure". that this was perhaps the first time a Pope replaced a Jew. 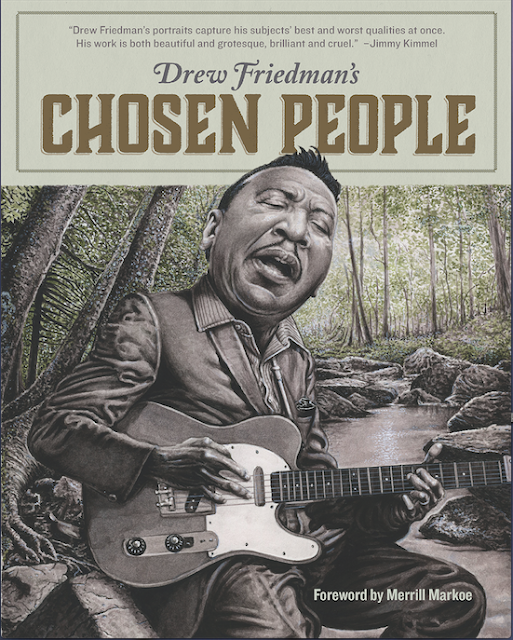 said "the cover was drawn by Drew Friedman, who is here..."
he asked me to", which got a laugh. Weiner finally retired from congress the following day. 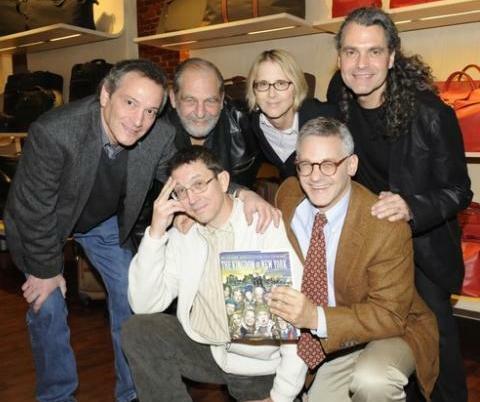 Encyclopedia" was hired as new editor. We hit it off. My final "encounter" with Jared came indirectly. 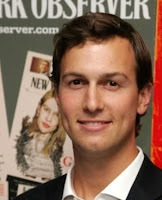 I was contacted by an employee from Jared's real estate company "Kushner Industries". 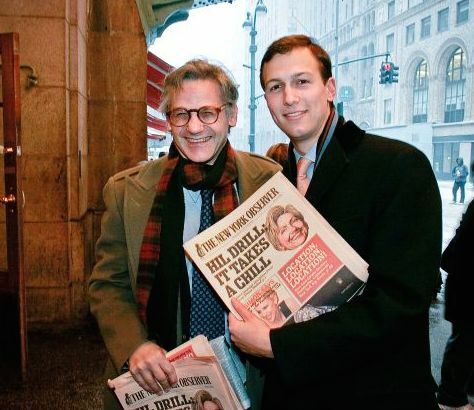 He told me I was Jared's first choice to illustrate a huge fold-out brouchure promoting luxury condos for sale in the Puck building on E. Houston St (where SPY magazine once had penthouse offices). 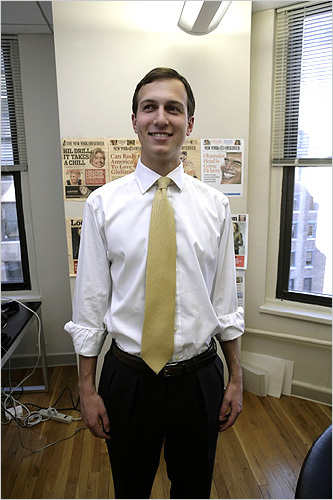 Jared had recently aquired the Puck building. The complex job would include rendering the history of the building, detailed maps of all the available units, and dozens of drawings of notables who had either lived or worked there, a "Sistene Chapel extravaganza", to quote Victor Juhasz. The deadline was very tight and the whole job had very little appeal to me but I asked for what I felt was a fair fee, considering the amount of work and the short turnaround. The reply was basically a very low-ball counter-offer, and I was also reminded that "Jared knows what you illustrators get paid". I thanked him for that information and politely declined the job. Victor Juhasz would tell me later that he was also contacted and also requested what he felt was a fair fee for the enormous amount of work, and he was also reminded that Jared knew what you illustrators got paid. Victor also declined. I have no idea who finally accepted the illustrious assignment, if anyone. 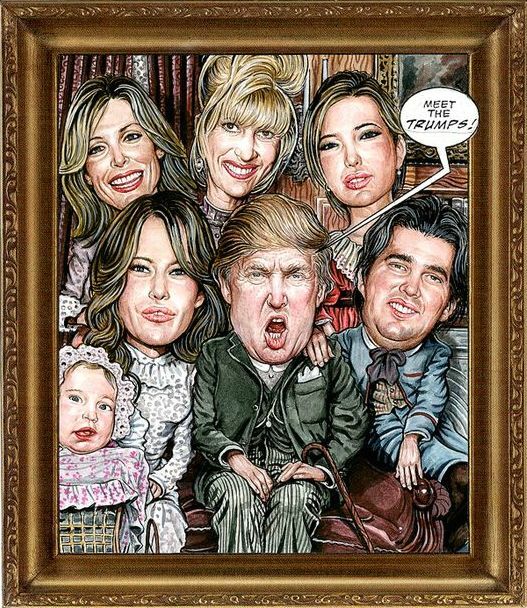 The NYO's new art director contacted me several times in 2016 to create covers, but I felt none of the ideas were good fits for me, especially an assignment to draw a positive representation of the Republican presidential candidate and Jared's father-in-law Donald J. Trump. 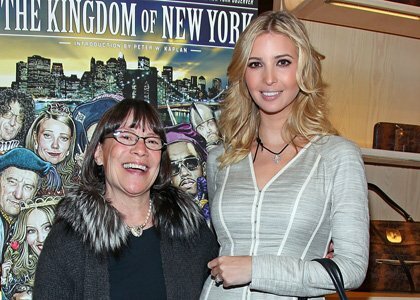 The NYO had been one of the only mainstream publications to endorse Trump in the New York presidential primaries. I declined the job. 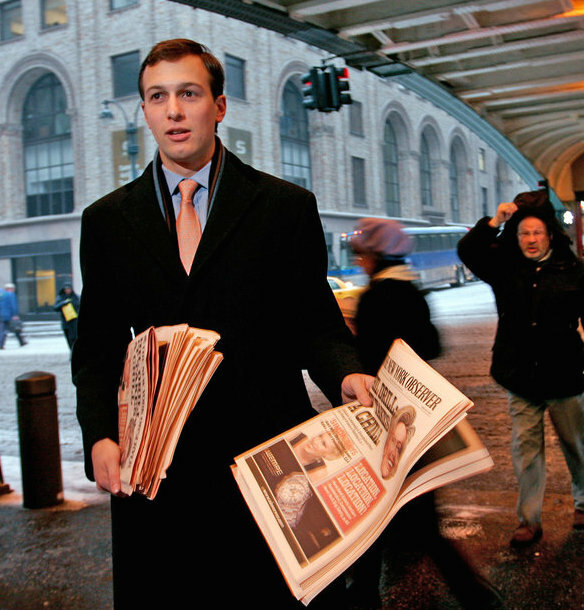 After Trump won the presidential election in November, Jared Kushner immediately ceased publication of the print edition of the Observer and he and his young family packed their bags and moved to Washington, DC. The rest you probably know. Excellent "Tales from the Observer"! Thanks for this blog entry, it's fascinating. As a long-time New Yorker, I know what assholes Trump and his extended family are. The first anecdote made me laugh, although it's kinda less funny given where we are now. A great read.Thaaaanks for the memories. I'd love to make a comment but there are far important people I could be commenting on right now. Thanks for the laugh, DD! Fine piece, Drew. Straight forward without judgment, yet the point of view is clear with subtle irony. 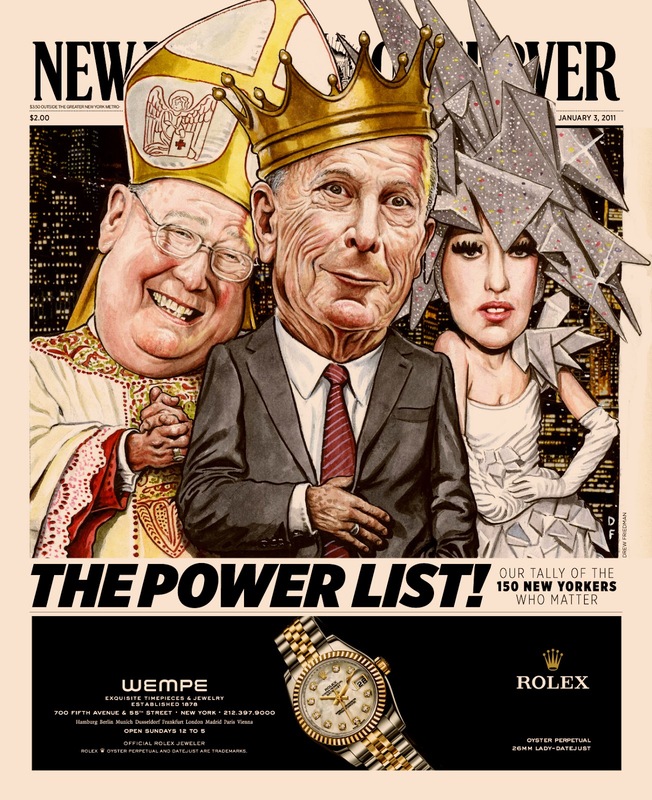 Screw all that Trump / Kushner nonsense... your drawings are FANTASTIC and will live on with far more respect than the current administration will. Great article, Drew. 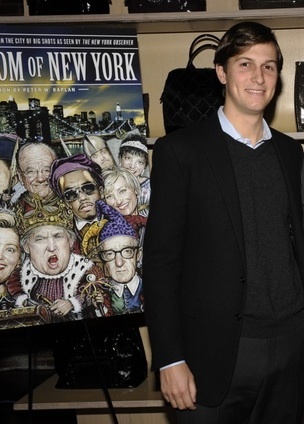 Now I am imagining Jared Kushner yelling out prices for illustrator's works like a commodities trader. Thanks for the memories, Drew. It was a lot of fun. xo Nancy B. Thank you Michael, I was unaware of that detail, but I'll certainly add it. I apologize for the off-topic nature of this comment, but I noticed some time ago you posted regarding the late, great Frank Frazetta. I thought you might have some interest in this unfinished piece I recently acquired. Though it is unsigned, I am convinced it is the work of Mr. Frazetta. All of the pieces are tied to 60's/70's MGM films, including some fantastic work from Howard Terpning, Robert McGinnis, and Frank McCarthy. I was curious to know if you had any information on this piece for the film A Man Called Dagger. At worst, I figured you could appreciate the art. Hope you enjoy! Thanks for sharing this Adrian, it's absolutely bt Frazetta but I have no idea if it was used for that particular film. I'll look into it and see what I come up with. The Frazetta art indeed wasn't used for this 1968 Spy spoof, The poster they used can be seen on Google images. Thank you for your input, Mr. Friedman! I was unable to locate anything related to the piece, but did realize it was likely linked to a Man Called Dagger. Hard to believe there is unknown Frazetta work out there, but here we are. :-) Again, I truly appreciate your input. P.S. Your illustration style, wow! I am a big fan. Thanks again Adrian, I included the image on my Frank Frazetta Comedy poster blog, and gave you a thanks. Kevin spacey allegedly broke more than the fourth wall ,couldn't resist . So what poor soul did do the illustrations if the puck building?? 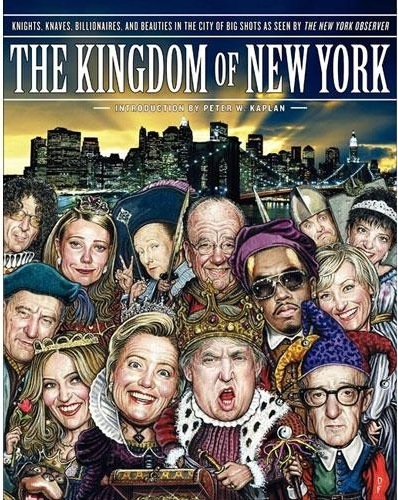 In 2009, 22 years and five editors after Arthur Carter hired me to write a weekly column for his new paper, I decided I had little taste in continuing to write for a proprietor whose father-in-law had for over two decades been known to my readers as "the Prince of Swine." I had known DJT in the late 60s-early 70s when he was still just a jerk from Queens looking for flight personnel to date and we were on the board of a Manhattan social club (a nightclub, really, we're not talking the Knickerbocker). Anyway, Drew's piece is terrific and brings back all sorts of memories. Thanks.